The government will provide $10 million per year to support programs for breeders and horsepeople through the Horse Improvement Program (HIP). This will support breeding and industry development for Ontario-bred horses and will be administered by Ontario Racing, replacing the Enhanced Horse Improvement Program previously administered by the Ministry of Agriculture, Food and Rural Affairs. "Our horse racing sector plays a vital role in our rural communities and is an important part of Ontario's heritage. 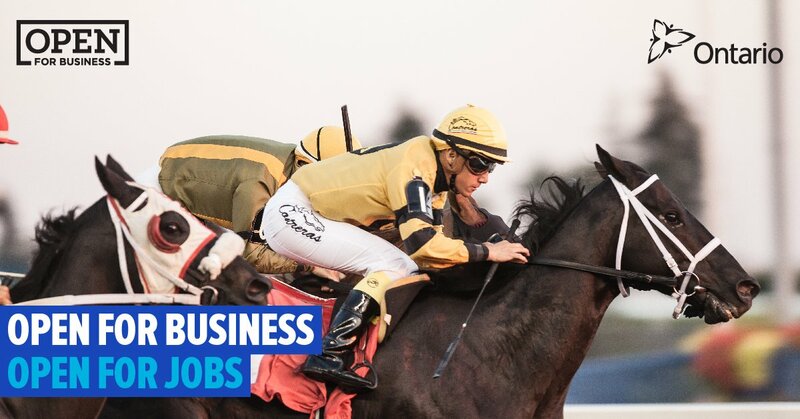 This investment will help support Ontario's breeders and horsepeople, and ensure the province's horse racing community is open for business, and can create and protect jobs," said Vic Fedeli, Minister of Finance. The government has also worked with its industry partners to reach agreements on packages through the Optional Slots at Racetracks Program (OSARP) that includes operational funding for eligible racetracks. These packages are designed to directly support the horse racing industry and rural communities. In addition to this funding through OSARP, the Ontario Lottery and Gaming Corporation (OLG) will provide financial support to the sector through the long-term funding agreement, beginning April 1, 2019. The agreement includes funding for racetrack operations and purse support of up to $105 million per year for up to 19 years. "Our government is committed to providing stable long-term support to help the horse racing industry build a more sustainable future for the rural businesses, jobs and communities that depend on it. This is a vital part of Ontario's heritage and our government is proud to stand behind our rural communities that rely on this industry," concluded Fedeli. The agreement will ensure greater accountability and transparency for how the funds are used. OSARP builds on the existing long-term funding agreement and is part of the government’s commitment to support racetracks facing hardships. Ontario is home to 15 racetracks — more than any other North American jurisdiction. Bob Broadstock, President, Quarter Racing Owners of Ontario Inc.